Carol was referred to SCULPTAFIT by her good friend Diane who is one of our Founder Clients. 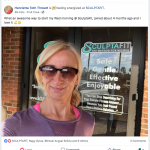 Diane joined SCULPTAFIT before we even opened! Carol is about 5 months into her gentle fitness program here and she has made STUNNING improvements. 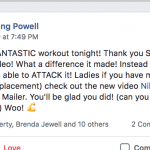 So, we asked her to summarize her positive habits that she follows in addition to what she does here with us and the other women in the SCULPTAFIT Studio. A – Breakfast is a small bowl of Fage 100% yogurt with honey and cinnamon. Sometimes I add a hard boiled egg later on if I am hungry. B – Lunch is a small portion of deli meat with tomatoes and mustard or mayonnaise in small amounts. No bread… and I don’t go hungry. C – If we are dining out I have a nice salad, any dressing is on the side in limited amounts, and then I add chicken or fish or even steak. D – Most dinners at home; I eat a salad/veggie, I limit bread, and then have a smaller portion of just about any food I want for supper. Steak, fish, chicken. I like to cook so it varies every night. E – I limit alcohol. I did not have any alcohol for the first 4 months of starting SCULPTAFIT. …and still mostly limit myself to a spritzer or a mixed drink with cranberry juice. I feel so much better. G – Snack during the day will be a handful of nuts and a piece of fruit. Always have fruit/dried fruit on hand. I have no added sugar at all, and no processed junk foods. E – In my 5-month progress photo on the right, you can now see space between my body and my arms, because everything is shrinking and tightening up. It feels unbelievable. And you can see my neck is smaller and tighter, and my smile even radiates a better, happier kind of energy that was fading away before I started at SCULPTAFIT. 2 – My cholesterol is DOWN. I have stopped taking cholesterol medicine as per my MD, on a 2 month trial basis!!! 4 – I had avoided getting on the scale for about a year! No kidding. It would just depress me. BUT now I check it once a week and and I am pleasantly surprised each time. With improvements like that, I can say this is really like a miracle. Yes, these new positive habits are a positive commitment, and they are SOOOOOOOO worth it! I know I’m at my best for my family, including my grand-kids. It feels amazing really. WE LOVE getting these kinds of success stories from our clients!!! It’s why we do what we do! This is our specialty, this is our gift. We will help you get where you need to be. Maybe even very similar to you or someone you know… And if so, we’d love to invite you in to try a free week here, no strings attached. FACT: 1 cigarette takes off 11 minutes from a smoker’s life. And do you know how much time every extra 5 pounds of body-fat takes off a life? It’s NEVER too early, and it’s NEVER too late, to make proper exercise a natural part of your lifestyle. Especially if you want to slow/reverse the aging process and shed the excess fat that has been accumulating on your body. As all of our female clients here in the Studio will agree, there are actually A LOT MORE “best anti-aging exercises” than the 3 we are highlighting today. A quick side note about “Anti-Aging”… When you reduce/remove excess fat and flab from the female body, while increasing natural fitness that also involves the mind – you get a cascade effect that not only slows down the aging process, but also reverses a lot of premature aging that the average woman has suffered through. Certainly a truth for women in their 40’s and 50’s, but even better; this holds true even for women in their 60’s and 70’s. Three things that decrease with each passing year in the women who is inactive, or exercising improperly are; muscle-tone, healthy posture and strength of balance. The Staggered-Stance Safety-Band Push-down addresses these 3 problems in a safe, compound movement that any woman can do – and progressively improve at, as physical ability increases (at the SCULPTAFIT Studio we call this “Aging in Reverse”). In middle-age and beyond many women begin to lose control of the pelvic floor and this results in various issues ranging from incontinence to decreased sexual function, and several others in between. The pelvic floor is made of many muscles, and like all muscles, if they are not used & stimulated safely and properly they become atrophied and lose their functional abilities. For many women, the decline of pelvic health is often linked to postpartum changes in muscle, tendon and connective tissue structure and integrity. And for others it’s simply a result of sedentary aging. The good news is, these ill effects can be reversed. The Core & Kegel Contraction Combo safely activates, stimulates and rejuvenates the pelvic region. This renews and strengthens a woman’s biological control and functional performance of the area often referred to as “the center of the universe”. Legs, buns, hips and thighs. Almost every woman wants improvements in those areas and the Trouble-Zone Slim & Tone does just that. There are 90 muscles in the female lower body, and as women age those muscle become mushy, weak and deflated. They sag and lose their shape. As women become less active in middle-age the issues become even more visible. Doing the wrong types of exercise won’t help (and sometimes make things worse). The critical key is to properly re-activate those 90 muscles, to burn away excess flab and lift, tone, tighten & shape the glutes, thighs and legs. Not only does the lower body regain an aesthetically pleasing look, BUT, there is also better strength, stamina, balance and functional stability that makes daily living awesome and combats the aging process like magic. Above you see what these gentle and safe exercise do individually. But there’s even more anti-aging ‘magic’ when these moves are combined. When your doctor says: “You really need to start exercising…” …it’s for all the reasons above, and then some. Best Option 2– Or, if you’ve seen and heard everything you need in the article above, and you’re ready “get on yourself on the right track once and for all”, then Send Nikki a note here, to see if we have any Private-Client Spots open.